Richard Hawkins was born in 1560, the only child of John and Katherine, the year after they had moved to London. It is not known whether he was born in London, or Plymouth. Little is known of his early life, but at the age of 22 he sailed with his uncle William for San Thome on the African Coast and then Brazil. The expedition comprised seven ships under William’s command. Richard captained one of the ships and was second-in-command of the squadron. It arrived back in Plymouth in November 1582 with great booty, estimated by a Dutchman in London at 800,000 crowns, of which money and pearls had already reached John Hawkins in London. 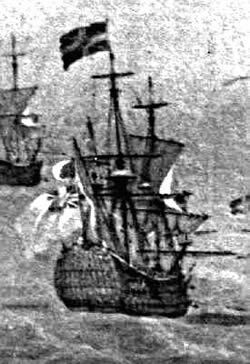 There is no record of how this was obtained, but the flagship of the Spanish fleet from Santo Domingo went missing about this time. The next we know of Richard is when he captains the Duck, 20 tons, in a fleet commanded by Francis Drake in 1585-6. They sacked and disarmed Santiago in the Cape Verde Islands, Santo Domingo and Cartagena in the Caribbean, and St. Augustine in Florida, before sailing for Sir Walter Raleigh’s new colony in Virginia. The booty did not cover the costs of the expedition, but they carried off 240 guns and forced Spain to spend time and money on fortifying its colonies. Two years later he captained the Queen’s ship, Swallow, against the Armada. He was a private shipowner by this time and records that two of his vessels were used as fireships against the Spaniards at Calais. 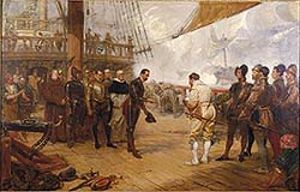 Richard Hawkins sailed with his father in 1590 when Sir John commanded a naval squadron of 6 ships that sailed along the Spanish coast and took some prizes. They were at sea for five months with little mortality, demonstrating the effectiveness of Sir John’s measures to improve supplies. ‘I set sail … about three of the clock in the afternoon, and made a board or two off and in, waiting the return of my boat, which I had sent ashore for dispatch of some business; which being come aboard and all put in order, I luffed near the shore to give my farewell to all the inhabitants of the town, whereof the most part were gathered together on the Hoe to show their grateful correspondency to the love and zeal which I, my father, and predecessors have ever borne to that place, as to our natural and mother town. And first with my noise of trumpets, after with my waits, and then with my other music, and lastly with the artillery of my ships, I made the best signification I could of a kind farewell. Richard was to be away for ten years and never saw his father again, having taken leave of him in London. He refreshed the crew on the southern shores of Brazil where he emptied the storeship and destroyed her. Soon after, he was deserted without cause by the pinnace, which returned to England leaving him alone and without a shallow-draught boat. Approaching the Straits of Magellan, he sighted land and, thinking that he was the discoverer, named it Hawkins Maidenland. In fact it had been discovered 8 months earlier and is now known as the Falkland Islands, unless you happen to be Argentinean. Hawkins was less of a man-manager than his father and his men were hungry for treasure and insubordinate. He attacked Spanish shipping at Valparaiso and took some gold, but became the quarry of a force much stronger than when Drake had raided Peru. He was caught by two large ships and 1300 men, against his 75, as he was about to leave Peru. The fight lasted three days, 19 of the men were killed and 40 wounded including Hawkins, who was carried below. The ship was sinking and he had no choice but to surrender on 22 June 1594. He was held prisoner in Peru for 3 years before being sent to Madrid where he attempted to escape. He returned to his wife Judith (Heale). Queen Elizabeth died in 1603 and James I, who also made him Vice-Admiral of Plymouth, knighted Richard that summer. In 1603-4 he was Mayor of Plymouth and its MP in the Parliament that Guy Fawkes attempted to blow up. He purchased the house and manor of Poole and Slapton from the Amerideths. The estate was situated between Dartmouth and Start Point and the residence was surrounded by many fine trees. It was about ¾ mile from the church and Mary Hawkins recalls that in 1888 village tradition still held that Lady Judith Hawkins used to walk from the old house to the church on a red velvet carpet, which a servant unrolled before her. The original house was demolished about 1880 and replaced by a farmhouse. Richard died of a fit on 16 or 17 April 1622 in the chamber of the Privy Council. Richard and Judith had 6 children: Judith born in Deptford in 1592 before he was taken prisoner; Margaret (1603); John (1604); Richard; Johan (1607); and Mary.